Univar (UNVR) to Report Q2 Earnings: What’s in the Offing? Univar Inc. UNVR is slated to release second-quarter 2018 results on Aug 1, before the opening bell. The chemical company logged a profit (on a reported basis) of $65.4 million or 46 cents per share in first-quarter 2018, up almost three-fold from $22.6 million or 16 cents a year ago. Adjusted earnings for the quarter came in at 42 cents per share, topping the Zacks Consensus Estimate of 38 cents. Revenues rose 8% year over year to $2,158 million in the quarter, beating the Zacks Consensus Estimate of $2,123 million. The company topped earnings estimates in all of the trailing four quarters, the average positive surprise being 26.9%. 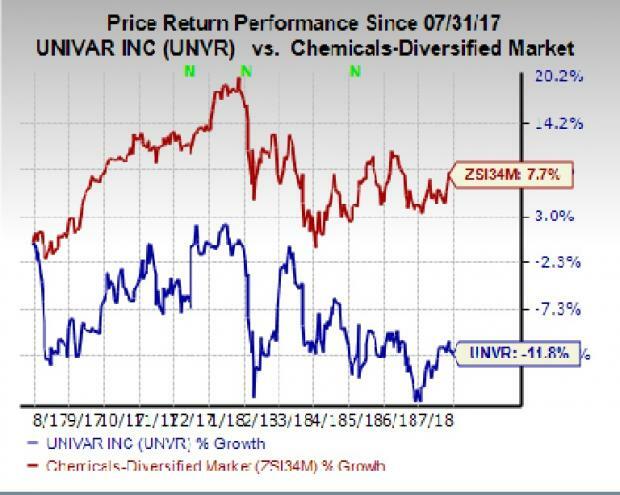 Shares of Univar have lost 11.8% over a year as against the industry’s 7.7% gain. For 2018, Univar sees adjusted EBITDA growth of low double digits. The company raised its adjusted earnings per share guidance to the range of $1.65-$1.85 from $1.60-$1.80 expected earlier. The company also expects high single-digit growth in adjusted EBITDA for second-quarter 2018. The Zacks Consensus Estimate for second-quarter revenues is pegged at $2,343 billion, reflecting an increase of 4.3% from the year-ago quarter. Net sales for the USA segment are projected to rise 4.3% rise year over year as the Zacks Consensus Estimate for the second quarter is pegged at $1,242 million. Adjusted EBITDA is expected to increase 6.5% year over year. The Zacks Consensus Estimate for the same is pinned at $98 million. Net sales for Univar’s Canada segment are projected to decline 1.6% year over year in the second quarter. The Zacks Consensus Estimate for the same is pegged at $484 million. The Zacks Consensus Estimate for adjusted EBITDA is pegged at $33.15 million for the second quarter, reflecting a decline of 10% year over year. Moreover, the Zacks Consensus Estimate for net sales at the EMEA segment stands at $508 million, reflecting an estimated 9.5% increase. Adjusted EBITDA is expected to rise 13% year over year as the Zacks Consensus Estimate is pegged at $40.95 million for the second quarter. The Zacks Consensus Estimate for second-quarter net sales for the Rest of the World is pegged at $109 million, reflecting a year-over-year increase of 9%. Adjusted EBITDA is likely to increase 44%. The Zacks Consensus Estimate for the same is at $7.05 million. The company expects a solid core business performance in the second quarter. Moreover, the company’s initiatives to improve operating cost productivity will likely support its margins in the to-be-reported quarter. Also, Univar is working on key initiatives — Operational Excellence, Commercial Greatness and One Univar — targeted at enhancing its profitability or return on investment. Reinvestment for core business growth, meaningful buyouts and lowering debt burden are the key features of the company’s capital allocation policy. Earnings ESP: Earnings ESP for Univar is currently pegged at -2.08%. This is because the Most Accurate Estimate stands at 47 cents while the Zacks Consensus Estimate is at 48 cents. You can uncover the best stocks to buy or sell before they’re reported with our Earnings ESP Filter. Zacks Rank: Univar currently carries a Zacks Rank #3 which, when combined with a negative ESP, makes surprise prediction difficult. Meanwhile, Sell-rated stocks (Zacks Rank #4 or 5) should never be considered going into an earnings announcement. Domtar Corp. UFS has an Earnings ESP of +1.70% and carries a Zacks Rank #1. You can see the complete list of today’s Zacks #1 Rank stocks here. Orion Engineered Carbons, S.A. OEC has an Earnings ESP of +3.85% and sports a Zacks Rank #2. The Chemours Company CC has an Earnings ESP of +2.38% and carries a Zacks Rank #3.